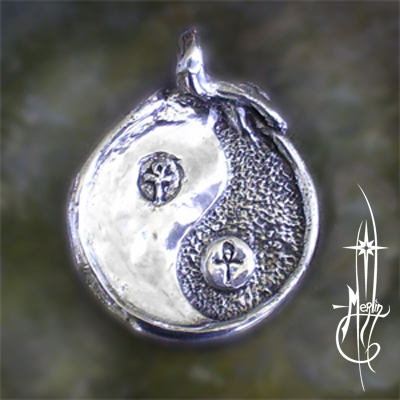 In my line of jewelry, I have a Yin-Yang Amulet. Wrapped around the edge is the Ouroboros and for the “two spots” signifying the Light in Darkness and Darkness in Light I placed pentacles. This amulet has been a part of my line for many years, quite popular when I was traveling from one festival to another. The combination of these three ideas in one piece provided an amulet that was both quite broad in meaning and focused for a particular kind of person. As I specialize in custom, I was glad to do it! And so, the most recent version of this complex amulet has the Ankh replacing the Pentacles: a Custom Yin Yang Amulet. If you like what you see in my Jewelry Line, but want a modification, Write me and let me know what changes you wish and I will be happy to do so. Modifications are only a small fee, but with alterations the piece becomes a one-of-a-kind! For more information on Custom, be sure to visit my How to order custom page!